Zucchini and I have a complicated relationship. Coconut Zucchini Muffins are my coping mechanism. With zucchini, July is all romance. It’s been ages since we’ve been together, we can’t get enough of each other, and sappy violin music follows us everywhere we go. I’m in summer produce heaven. By August, zucchini gets clingy. It moves from occupying a small corner of my crisper to sprawling lawlessly all over the bottom shelf of my refrigerator and out onto the counter. What was once a good thing (the occasional summer veggie burrito or zucchini waffle) deteriorates into total squash mutiny, and I find myself struggling to find creative ways to deplete my supply. Coconut Zucchini Muffins are my new favorite way to eat up superfluous zucchini. For the most part, zucchini acts as a blank canvas in baked goods, and tropical, happy coconut is a perfect partner. These babies boast a coconut triple threat: healthy coconut oil for mega moisture, shredded coconut in the batter for natural sweetness, and toasted coconut on top for texture and crunch. A single batch of 12 Coconut Zucchini Muffins uses two full cups of shredded zucchini. We’re eating our veggies and putting a dent in the zucchini supply. High five! I also recently read that the coconut oil in this recipe is good for my hair. (Hello, I’m having seconds!) Applesauce provides even more healthy moisture, and whole-wheat flour adds fiber. This kind of good behavior is both a wonderful way to begin our morning and demands oodles of drippy glaze. Be generous. Today, August 8th, is National Zucchini Day, and I’m celebrating with my lovely friend Marnely of the blog Cooking with Books. (You may remember Marnely from this tasty recipe for Sriracha Crab Salad Rolls.) The two of us met through blogging, then spent time together when Ben and I visited Cape Cod, where Marnely lives and works as a professional chef on Martha’s Vineyard. 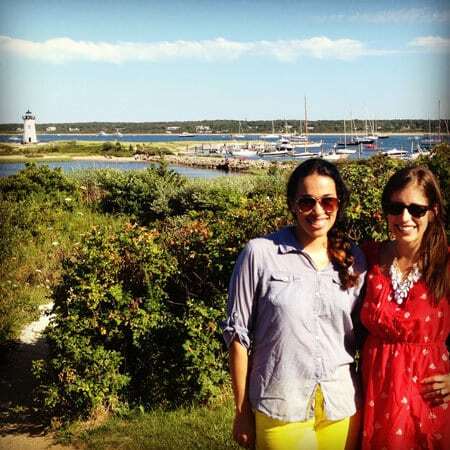 Marnely is absolute doll and, at the moment, is working crazy hours to keep up with Martha’s Vineyard’s busy tourism season, including prepping for President Obama’s visit to the Vineyard (!). While she’s in the kitchen, I’m posting on her site, so if you have some time, head on over and leave her some love. Happy National Zucchini Day! 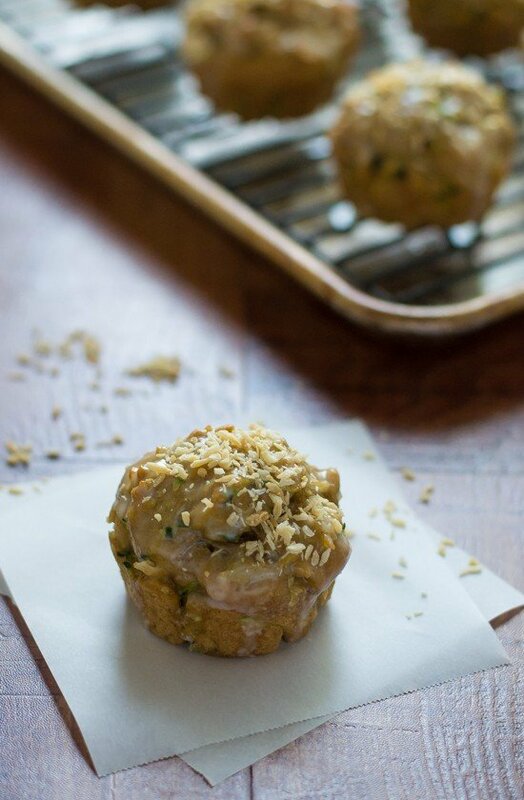 Embrace the overload with Coconut Zucchini Muffins. Maybe I’ll survive this relationship after all. 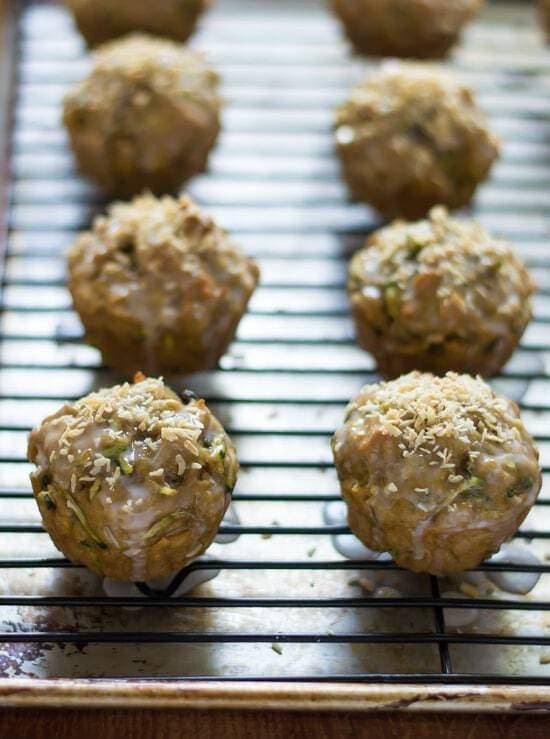 Healthy coconut zucchini muffins made with coconut oil, toasted coconut and whole wheat flour. Super moist and a perfect way to use up summer zucchini! Place rack in upper third of oven and preheat the oven to 350°F. Lightly grease a standard 12-cup muffin pan. In a large bowl, stir together the white whole wheat flour, all purpose flour, salt, baking soda, baking powder, and cinnamon. In a medium bowl or large mixing cup, whisk together the eggs, honey, brown sugar, coconut oil, and vanilla until well blended. Add all at once to the dry ingredients, stirring by hand just until combined. The mixture may be a little lumpy. Fold in the zucchini and coconut. Scoop the batter into the prepared muffin pan. Bake for 20 to 24 minutes, or until a toothpick inserted into the center comes out clean. Remove from the oven, cool in the pan for 10 minutes, then transfer to a wire rack to cool completely. Meanwhile, prepare the glaze: Stir together the powdered sugar and salt, then whisk in almond extract and the milk, 1 tablespoon at a time, until the desired consistency is reached. Dunk the top of each muffin into the glaze, then sprinkle with toasted coconut. Zucchini is needy. Because there’s too much of it, and summer fruit is sexier. This recipe is awesome, though! It’ll get rid of that excess so deliciously. Ha! I hate needy veggies! This is the perfect solution! Just what I need to mix up my zucchini baking routine! These sound great! Erin, love these muffins!! I’m going to bake a cake or something with my zucchini too. . love the addition of the coconut! heading over to get the recipe now! See you tuesday! I love cooking with coconut oil! I still have never baked with zucchini though. I clearly need to change this! I can be the same way about zucchini and have yet to make a zucchini muff this season, so your recipe is looking mighty fine! Yup, coconut oil is thebombdotcom! And it’s woooonderful for your skin and hair. I know some people actually put it on their scalp or add it to their conditioner, which is something I’ve been meaning to try. Have a great weekend, my dear! I actually love zucchini in dessert and snack recipes! Maybe it’s because I love the stuff. who knows. Must try! Well it does look like you worked this life complication quite satisfactorily to the benefit of all. I am a coconut nut and zucchini makes everything so moist. So its a winning combo as far as I am concerned. Thanks so much Carol! I’m glad you approve. Coconut + zucchini + carbs = this all needs to get in my belly. ha! totally get ya on zucchini. 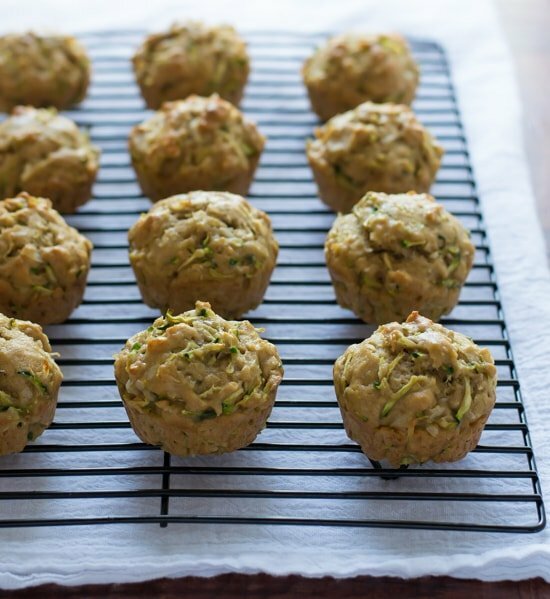 love the tropical twist on these zucchini muffins. Zucchini + coconut = Yum! These muffins looks scrumptious–I want one right now. You’re right, zucchini needs to know its limits. But these muffins? Beautiful way to keep the relationship going strong! I love the flavor combination of coconut and zucchini. Also, rolling them just makes it nicer than a muffin! I’m having the exact same relationship problems with my zucchini at the moment. LOL. But that’s definitely not gonna stop me from trying these GORGEOUS muffins. Did I mention I’m in love with that lovely glaze?! ;) Pinned. Jealous that you got to meet her, I’ve been a fan of her blog for a while! haha I hear ya – I’m always trying to cram zucchini into everything this time of the season!! Zucchini and coconut?? Sounds awesome! Coconut makes everything better and these muffins look fantastic! What… there is seriously a National zucchini day?! Thats brilliant. Very neat twist with this recipe Erin, cant say Ive ever tried, but reckon I need too. It is real and it is squashed-filled Anna! And this recipe is definitely worth a shot. If you like coconut, you’d adore these! A fantastic use of summer squashes. These muffins look awesome, Erin. Aw these are really sweet! Love the glaze on top! For the glaze, you have 2-3 tablespoons and then its blank, I’m guessing you want to add powdered sugar to that, yes?? Ron, I am so sorry about that! It should be 1 cup powdered sugar and 2-3 tablespoons milk. I’ve updated the recipe. Thanks for pointing that out! I made these yesterday, used coconut extract instead of vanilla, and skipped the glaze. You don’t need it for these to be wonderful! A really yummy not-too-sweet breakfast muffin! Thanks so much for sharing! I love your recipes. Tina, I am so excited to hear this. The coconut extract sounds delicious. Thanks so much for your kind words and for taking time to leave this lovely review! Erin, I can’t have gluten. Can I substitute the flour in this recipe? Hi Mallory! If you can’t have gluten, I’d suggest trying this Chocolate Chip Paleo Zucchini Bread. The recipe is already gluten free! If you’d like to make these muffins, you could try substituting a gluten free baking blend like this one. I haven’t tested the muffin recipe this way, so it would be an experiment on your part, but it is my best suggestion. Use your best judgement, and if you decide to play around with the recipe, I’d love to hear how it turns out!